HelpSite has a feature to make it easy for both you and readers to link to specific sections of an article. What are heading links and why do they matter? Suppose, on your knowledge base, you have published a long article with three major sections, where each section has two subsections. You may want to point somebody to a specific section of that long article. If you just send them to the URL (web address) of that article, they'll be sent to the top of the long article instead of the specific section (which may be two-thirds down the page) you feel is most important for them to see. 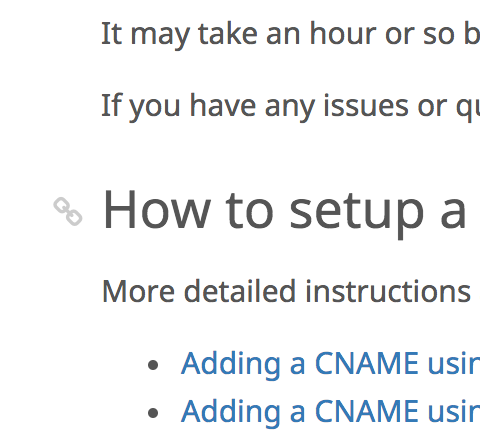 HelpSite automatically generates an "anchor tag" link next to each heading and subheading in your knowledge base article. When you hover your mouse over any heading in your article, you'll see the little link icon ( ), as shown below. Just click the anchor/link icon next to the desired heading in your article, and you'll notice the URL in your web browser will have a section with your subheading appended at the end, like #your-subheading-here. (If your article's page is long enough, clicking this icon will also make the page scroll up so the referenced heading is at the top of your screen). Copy the URL in your web browser (which should now include #your-subheading-here at the end) and paste it as the target for your link. For example, you could paste this URL into an email to a coworker or customer, or you could include it as the destination of another link (like below). Now, when visitors follow this specific URL that you copied, they will be sent to the specific heading on the page that you want them to see, even if that section is toward the bottom of a long article. In either case, follow the steps above to copy the URL to the desired section you want to link to. 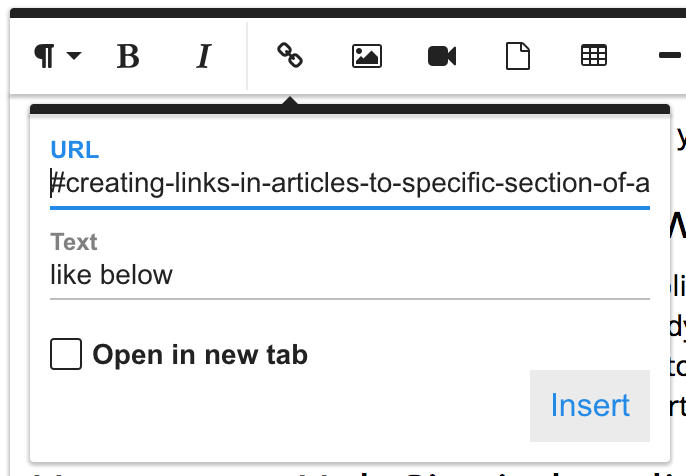 Then, just like any other link, you can paste it into the "URL" field in our article creation form. If you have any questions about this feature, feel free to get in touch!